If the economy continues to deteriorate, the poor won't just always be with us--they'll be us. 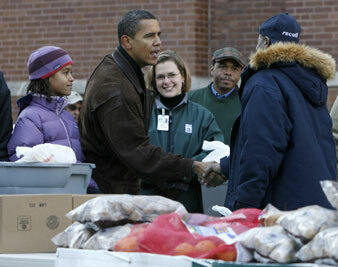 Obama and family helped out at a Chicago Food Bank in December. In order to appreciate the breadth and ambition of the economic stimulus program Barack Obama has outlined, it’s useful to look back to where the debate was just last month. The weeks leading up to the election had been dominated by economic debates at once facile and irrelevant. John McCain argued that a top marginal tax rate of 39 percent was a stalking horse for socialism, and pundits–from Jim Lehrer to David Broder–pushed the perverse, bizarre notion that the economic crisis meant that the next president would have to tighten the federal belt. Such lunacy prompted us to write on October 8 that “the only way to relieve economic suffering, create jobs and restore stable growth is for the federal government to step in and bolster demand by spending money. Lots of it.” A month later, we published an article by University of Massachusetts economist Robert Pollin that spelled out how the money should be spent in order to maximize job creation, increase the long-term productive capacity of the economy and reduce our collective carbon footprint. It’s these priorities that are reflected in Obama’s initial plan, which focuses on school modernization, energy efficiency in public buildings, healthcare information technology, broadband and basic infrastructure. It’s not a coincidence. As the New York Times noted, Pollin’s work served as the “blueprint” for the plan. As a basic outline for what a smart, effective, progressive public works project should look like, Obama’s proposal is more than promising: it’s stirring. But–and you knew there’d be a but–economic management at this crucial juncture is a matter of triage. If the stimulus is aimed at the millions who have slipped or are about to slip from the middle class into poverty, it must also include support for the millions of Americans who are slipping from working poverty to abject penury, from penury to desperation. The statistics are terrifying. In 2007 more than 37 million Americans were living in poverty–that’s 12.5 percent of the population subsisting (or not) on less than $21,200 a year for a family of four. That shameful figure doesn’t take into account this year’s rise in unemployment–when 1.9 million Americans lost their jobs. Food stamp caseloads rose by 2.6 million people between August 2007 and August 2008; in twenty-five states, at least one in five children is receiving food stamps. According to the USDA’s annual report on food security, nearly one in eight Americans (36.2 million adults and children) were “food insecure,” meaning that they had difficulty getting enough food, due to a lack of resources. Social service agencies, shelters and food banks around the country are reporting spikes in the number of people requesting services, just as many of those agencies face dwindling donations and cutbacks. This is why increased food stamp benefits, rental assistance and aid to state governments must be at the heart of any stimulus package. Extending unemployment benefits–which fewer than 40 percent of the unemployed now receive–to laid-off low-wage and part-time workers would provide an immediate jolt to the economy. We understand why it’s smart politics to pitch all economic policy in terms of the middle class: the poor, as they say, are always with us. But if the economy continues to deteriorate, the poor won’t just be with us, they’ll be us. And they’ll be much harder to ignore.